Financial Planner or Financial Advisor: What Is The Difference? Canadians are presented with a broad spectrum of financial management professionals. Financial planner and financial advisor are a couple of popular titles for individuals who help people manage their financial matters. It is important to understand the difference between a financial planner and a financial advisor. The financial advisor industry is overwhelmed with practitioners with varying levels of qualification and education. Financial planners and advisors are both considered as investment product providers looking for your investable assets. As a result, it is important to understand financial planning and consider the valuable advice provided by each. 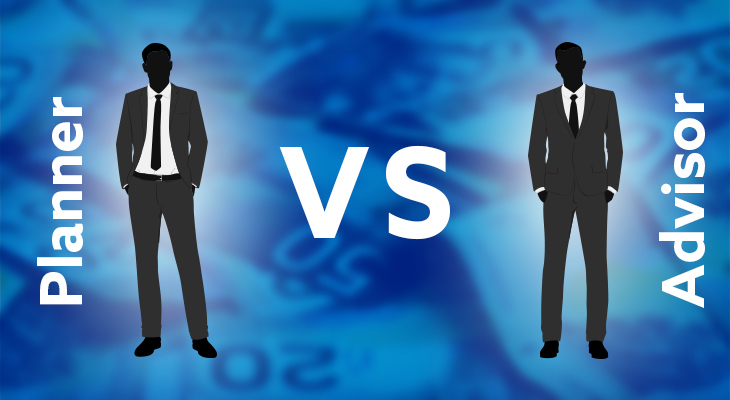 Let’s have a look at what differentiates a financial advisor from a financial planner. This is a broad term used for a professional who can provide a range of financial services. A financial advisor will help you with any number of money-related tasks when you pay for his services. For instance, a financial advisor might help you broker the sales and purchase of funds, manage investments, or help you create an estate plan. However, a financial advisor must have a license and other credentials in order to work with the public. From estate planning to money managers, financial advisors can provide diverse financial services. The role of a financial planner is relatively limited when compared to that of a financial advisor. A financial planner helps individuals and businesses create a strategy to meet long-term financial goals. They may specialize in retirement, taxes, investment and estate planning or they may hold several designations and licenses. Chartered Financial Analyst (CFA) and Certified Financial Planner (CFP) are a couple of designations which a financial planner might hold. There is a set of education, work history, and examination to acquire these licensures. Ideally, your Financial Planner provides you with an Engagement Agreement that outlines the level of service provided. There should be a fee for the services he provides. This presents the client with the best option for objective advice. The investment (mutual funds) industry is moving to a fee service in lieu of trailing commissions. This supposedly gives the client disclosure and assists clients in understanding the cost of investing. The Advisor works for a third party. Regardless of who the Advisor works for, his or her first responsibility is to their employer, not the client. It is important to consider that an advisor shouldn’t charge a client directly for his services, on the other hand, a financial planner works with individuals and businesses without having a third-party involved in the process. Kewcorp Financial is an Edmonton-based company where we provide comprehensive financial planning services with an Engagement Agreement. We are here to serve your financial planning needs. Contact us or visit our website for more information!